Following the release of his third album 'Starboy', we look back at the first three chapters of his life. 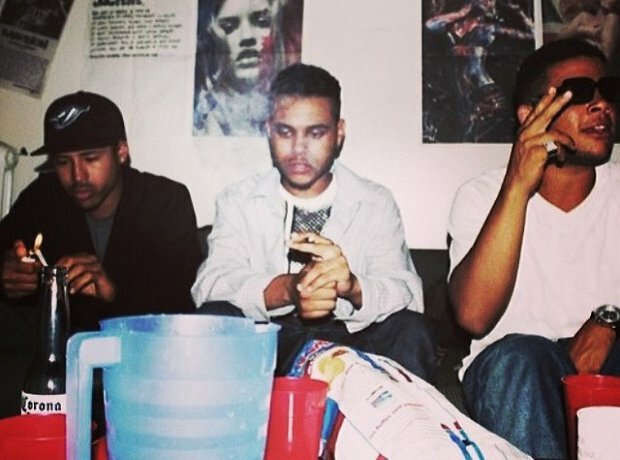 Tesfaye explained the origin of his stage name in a Reddit Q&A with fans: "I left home when I was about 17 dropped out of high school and convinced Lamar [XO crew member] to do the same lol. We grabbed our mattresses from our parents threw it in our friends s****y van and left one weekend and never came back home... I hated my name at the time though so I tried it as a stage name. It sounded cool. I took out the "e" because there was already a canadian band named the weekend." Some have claimed that XO simply stands for hugs and kisses, while others argue the letters represent the drugs ecstasy and oxycontin. Given that XO is part of the slogan "XO 'til we overdose" the latter seems more feasible. 3. The Weeknd's latest album is named after the late David Bowie. "I just love Bowie, I think he’s the ultimate inventor,” he told WSJ. 4. The Weeknd gave up "almost half" of one of his old albums to Drake. 7. Why does The Weeknd spell his name like that? The Weeknd recently confirmed during a Reddit AMA that he spells his name without the "e" because of copyright issues. He said: "I hated my name [at the start of my career] so I tried it as a stage name. It sounded cool. I took out the 'e' because there was already a Canadian band named the weekend." 8. When did The Weeknd first start to get noticed? When three tracks - 'What You Need', 'Loft Music', and 'The Morning' - credited to The Weeknd first appeared on YouTube in late 2010, little was known about the artist behind them. In 2012 more details gradually emerged and The Weeknd was revealed to be the stage name of singer Abel Tesfaye. Born in Toronto, Canada, Tesfaye is 25. 9. What is The Weeknd's real name? 10. What's the difference between The Weeknd's mixtapes and 'Trilogy'? Tesfaye found fame through a trio of self-released mixtapes he released in 2011, named 'House of Balloons', 'Thursday' and 'Echoes of Silence'. They were later remastered and reissued together as the compilation album 'Trilogy', along with three additional songs, in 2012. 11. The Weeknd's 'House of Balloons' is a real place. The titular domicile of The Weeknd's debut mixtape actually exists according to Tesfaye. He revealed that the address is 65 Spencer in Parkdale, Toronto in a Reddit Q&A. The ominous looking place pictured is what comes up on Google's Street View at that location. 12. Tesfaye didn't leave Toronto until he was 21-years-old. "From when I was born to when I was 21, I never left Toronto," Tesfaye told Complex. "That’s why I’m such a city cat. 'Trilogy' is my experiences in those four walls." 13. The Weeknd is cool with Drake, despite rumours. Tesfaye denied there's any bad blood between the two despite his decision not to sign to Drake's OVO Sound label. "I told him from day one what my decision was going to be," said Tesfaye in Complex, "I wasn’t going that route. I was going to go my own route. And he supported me." 15. Tesfaye came up with title for 'Kiss Land' after overhearing it in a conversation. He covered MJ's 'Dirty Diana' on his third mixtape 'Echoes of Silence'. 17. Does The Weeknd have a girlfriend? Following his relationship with Bella Hadid, the Canadian moved on with singer Selena Gomez. Selena and The Weeknd split in October 2017 and since then he's been rumoured to be dating Bella again. 18. How old is The Weeknd?